I want to beg you, as much as I can, to be patient toward all that is unsolved in your heart and to try to love the questions themselves like locked rooms and like books that are written in a very foreign tongue. The point is to live everything. Live the questions now. Perhaps you will then gradually, without noticing it, live along some distant day into the answer. Welcome to the trumpet studio at the University of Puget Sound. My teaching is rooted in the fundamental techniques appropriate for all styles of music, that is, tone production based on strong breath support focused by an efficient embouchure. Though my primary experience is in the standard orchestral repertoire, I have performed in a wide range of circumstances including musical theater, jazz and rock and I bring this diverse experience to my teaching. 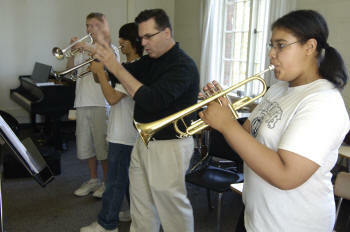 Trumpet lessons are available for credit for current UPS students with the approval of the music department. 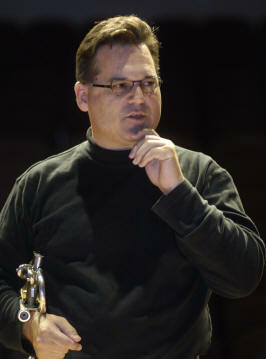 Non-UPS trumpeters or UPS students not wishing academic credit may study through the community music department. Prospective students are invited to contact me directly or may visit music admissions for more information regarding the music curriculum, auditions and application procedures. The music department owns numerous professional quality instruments to facilitate trumpet students gaining the experience they need to succeed as professional performers.